Cavom® contains all the nutrients in the right proportions. 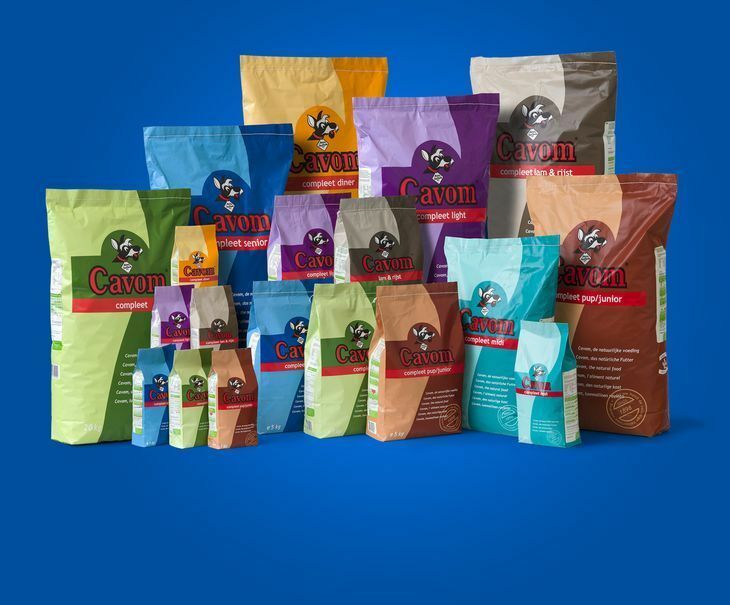 Cavom contains pure meat, no unnecessary harmful colorings, flavors and fragrances. Perfect nutrition for every dog! Cavom contains all essential nutrients in the right proportion. Supplementing with vitamins and mineral is therefore not required. Cavom promotes the fertility of male and female dogs. With high-quality animal and vegetable protein for an optimum amino acid pattern. Cavom keeps your dog’s teeth healthy longer, because the granule has been kept quite hard. This combats the formation of tartar build-up. Cavom is economical in use due to its high energy value and easy digestibility. Your dog needs less food, which translates into less faeces. Nutrition is very important to a dog's health. Overfeeding a dog will cause it to become obese. Calculate the optimum amount of food for your dog by clicking on the product of your choise. * The required daily amounts are dependent on the dog’s breed, age and level of activity. Divide the quantity of feed over 2 meals per day. The quantities shown are intended as a guide only and they may vary for each particular dog. Ensure that fresh water is always made available. * You must multiply the recommended quantity by the weight of your dog in kilos, Divide the quantity of feed over multiple meals per day. Soak the first 2 weeks in milk and serve as a thin porridge, after 2 weeks switch to buttermilk or water, and gradually start adding les liquid. This chart is of course only a guideline and should be adjusted if necessary. * Mix with warm water and Cavom compleet diner is ready for use. The required daily amounts are dependent on the dog’s breed age and level of activity. The quantities shown are intended as a guide only and they may vary for each particular dog. In 2003 we received a Kuvasz who had always eaten Cavom. This is what we fed him for the first year too. Then he was fed the food we always use for our dogs. Now we feeding our dogs Cavom again for the past 1 1/2 year. We have chosen Cavom because we had a good experience with this redeployment dog and we were looking for an affordable good food!